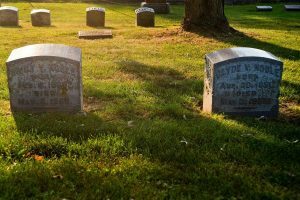 BLOOMINGTON — The history of Bloomington-Normal, with a nod to Illinois’ bicentennial year, will be on display at the 2018 Evergreen Cemetery Walk. 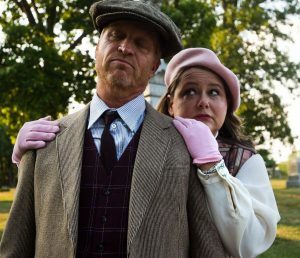 David Krostal and his wife Cristen Monson, portraying Clyde and Emily Vicchi Noble, rehearse recently for the 2018 Evergreen Cemetery Walk. 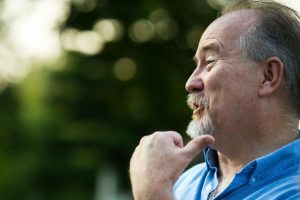 e stories of eight McLean County residents, including early settlers, circus performers and an Illinois governor. Those former residents are all buried in Evergreen Memorial Cemetery, 302 E. Miller St., Bloomington. Costumed actors will portray the featured individuals during the walk at 11 a.m. and 2 p.m. Saturday and Sunday and Oct. 6 and 7. Even though McLean County is not as old because people started settling here in 1822, “we want to share our unique contributions to Illinois’ 200 years of history — everything from helping Abraham Lincoln to the presidency, our fast and rich circus heritage, politicians and even the darker side of history with race relations,” said Candace Summers, director of education at the McLean County Museum of History. In recognition of the state’s bicentennial, the cemetery walk will also feature a 45-minute performance by the Brass Band of Central Illinois at 1 p.m. each day. The event is a partnership of the museum, the cemetery and Illinois Voices Theatre Echoes. David Krostal and his wife, Cristen Monson, will portray circus performers Clyde and Emily Vecchi Noble. The Nobles represent the long circus tradition in McLean County, and the actors will talk about how the Nobles met while performing in the Ringling Bros. Circus, said Rhys Lovell, the walk’s theatrical director. The Nobles had to conduct their courtship in secret because circus performers were not allowed to socialize with each other, said Lovell. After marrying, they embarked on a long career together until their retirement in 1918. After settling in Bloomington, Clyde Noble ran a jewelry store downtown in the 100 block of North Center Street. The Nobles helped start the Bloomington Community Players and were active in civic service. 2018 Evergreen Cemetery Walk theatrical director Rhys Lovell gives instruction during a recent rehearsal. This year’s portrayals are, in part, the product of the creative interpretation of Lovell and fellow writers Kathleen Kirk, Todd Wineburner and Maxwell Johnson. Also being portrayed are Adlai E. Stevenson II, the only Illinois governor buried in the cemetery; Jane Frankeberger Hendryx, one of the county’s earliest settlers; Henry W. Funk, a well-known horticulturist, although not related to the well-known family that founded Funks Grove; and Lue Anna Brown Sanders Clark, who opened up her home for many years to black men attending Illinois State Normal University because they were not allowed to reside on campus. The walk also features Augusta “Gussie” Becker and Francis Cahill, who were a housemother and resident, respectively, at the Illinois Soldiers’ and Sailors’ Children’s School in Normal. The gravestones for Emily Vicchi Noble and Clyde Noble are shown at Evergreen Memorial Cemetery in Bloomington. Each tour lasts 90 minutes to two hours. Attendees should be prepared to walk about a mile and to stand for five to seven minutes for each performance. Some wheelchairs, seated-walkers and seat canes will be available to borrow free of charge with an advance reservation from the museum. Tickets are available at the McLean County Museum of History, Evergreen Memorial Cemetery and Casey’s Garden Shop in Bloomington, and Garlic Press in Normal. Cost is $15 in advance; $17, day of the walks. For McLean County Museum of History members, the cost is $12 in advance and $14 performance days; and children/students, $5. The walk is free for students participating in school tours from Oct. 1-4. Illinois Prairie Community Foundation awarded the McLean County Museum of History a $2,500 grant to help fund the walk for schoolchildren.